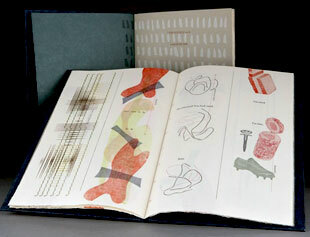 Barb Tetenbaum has been printing artist books since 1979 under the imprint "Triangular Press". She has also explored the act of reading outside of the book form in installation-art. She is currently Professor and Department Head of Book Arts and the Oregon College of Art and Craft. Portland, Oregon: Triangular Press, 2015. Edition of 30. 17 x 10 x 3". Letterpress printed texts and images cut into strips and adhered to Japanese ‘silk tissue’ (gampi). Sewn to cloth and wood backing. Supported by a wood wave-form platform and held inside a lidded box made of cloth and book board. Signed and numbered by the artist on the colophon. 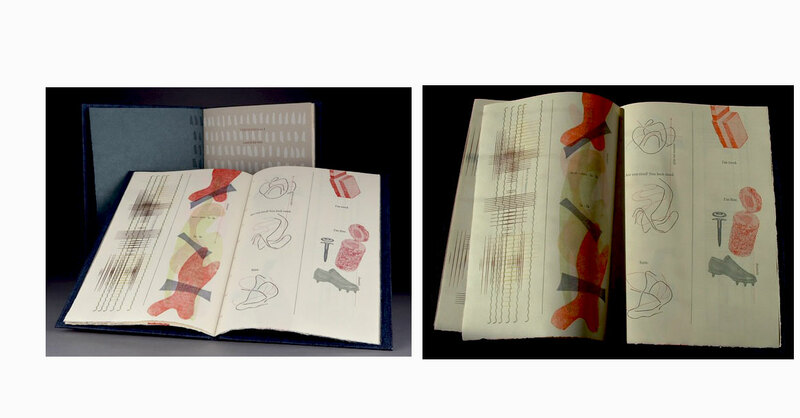 Barbara Tetenbaum: "This project represents a three-year investigation of wave forms, and is illustrated using articulated paper pages, poetry, and other writing. 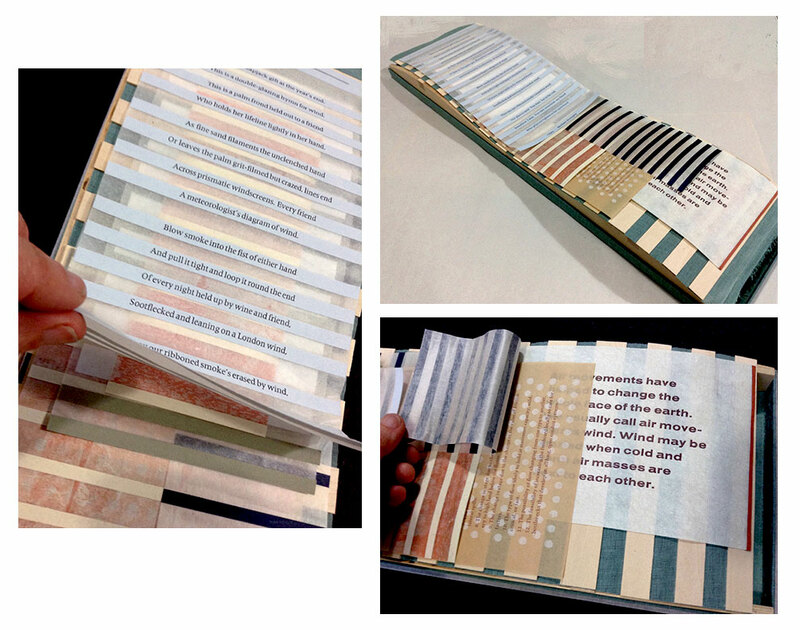 The pages are constructed using Japanese silk tissue (gampi) as a backing for the adhered paper strips. I used a variety of space between the elements to create different sounds and tensions when the viewer turns the page. "I chose Michael Donaghy’s poem 'Glass' because it has a rhythm that mimics wave action (it is a sestina, a form which uses repetitive word endings) and provided the title for the project in the line ‘a meteorologists diagram of wind’. "The poem is layered with other pages that support and illustrate my underlying concept. Some pages create a distinct sound or tension, other pages contain texts about wave action in nature and industry, others contain images. The pages are sewn to a cloth and wood backing which can be lifted up and hung on the wall, or left to rest on the undulating wood platform." 16 x 20"; 24 pages. Hand-written texts pressure-printed onto tissue paper. Laser-printed texts printed onto UV-Ultra. Covers: printed Zerkall paper dry-mounted between batiste. Bound with wooden spine and bulldog clips. Wrapper constructed of book cloth and book board. Signed and numbered on the colophon by the artist. Barbara Tetenbaum: "During a 2-week residency at Caldera, near Sisters, Oregon, I rewrote Ralph Waldo Emerson’s essay 'Circles' using a special pen that leaves a hard raised mark if you go slowly enough. I wrote out 23 pages which took nearly 30 hours. 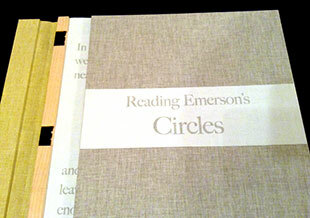 I did this to accomplish three things: to force myself to read Emerson’s essay very slowly; to record distractions and thoughts that I had while reading his words; to create a surface that I would later use to print an edition of artist books using a technique I developed and call 'Pressure Printing.' Pressure printing uses a low relief plate (my Emerson writings) which is put underneath the paper to be printed (tissue paper) and then run through the letterpress over a type-high inked block. This allows the low relief image to grab more or less ink from the block as it rolls over it. My thoughts and distractions are laser printed on transparent paper and interleaved within the book to show that reading is rarely linear, but much fuller experience unique to the reader." 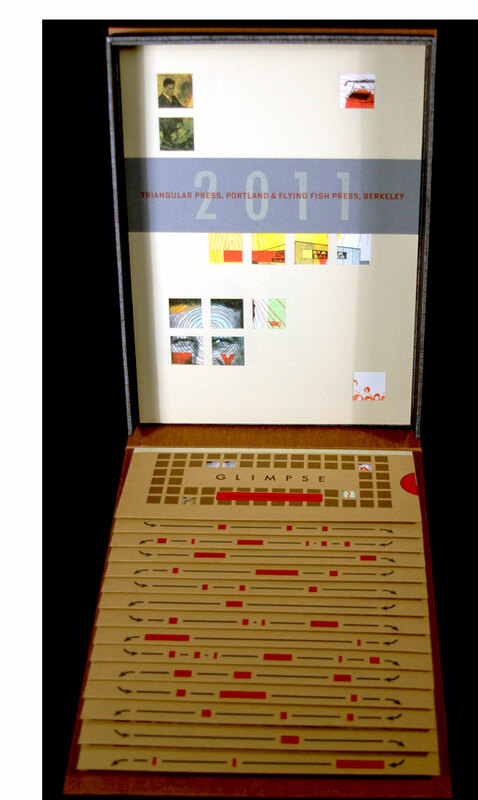 Portland, Oregon: Triangular Press, 2012. 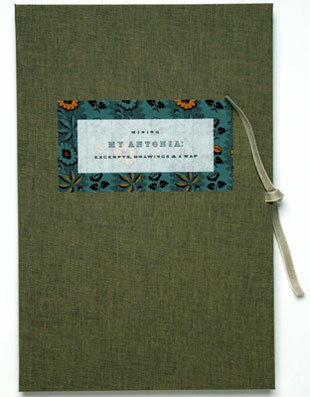 Edition of 250. 7 x 9.25"; 36 pages. Interior sections digitally printed using French and Jefferson papers. Other text letterpress. Designed by Jennifer Viviano. Handbound by the artist. In wraps with fold out front and back covers. 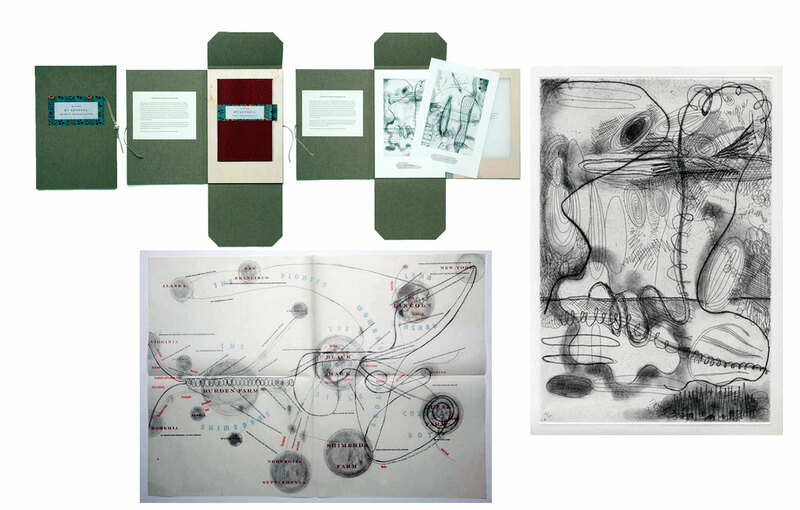 A documentation of Barbara Tetenbaum's three projects concerning different aspects of her reading of Willa Cather's My Antonia: the original installation at Reed College in 2010, the artists' book Mining My Antonia; and the installation at the Hoffman Gallery at Oregon College of Art and Craft in 2012. It includes an essay Reading the Literary Text as 'Art in Space': Barbara Tetenbaum's My Antonia by Nathalia King, Professor of English and Humanities at Reed College. Portland, Oregon: 2011, Triangular Press & Zornado Productions. Limited edition [limitation unstated]. 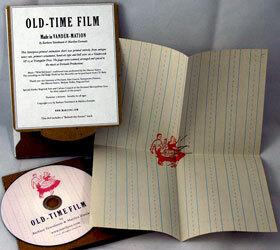 5.25 x 7.5" lightweight cardstock enclosure containing a DVD and (for the first 300) a folded letterpress print (8.5 x 10.75") on composition paper, showing a single design element used in the movie. DVD contents: Old-Time Film (2 min, 58 sec) and Behind-the-Scenes (2 min, 48 sec). Animated, directed, and printed by Barbara Tetenbaum and Marilyn Zornado. 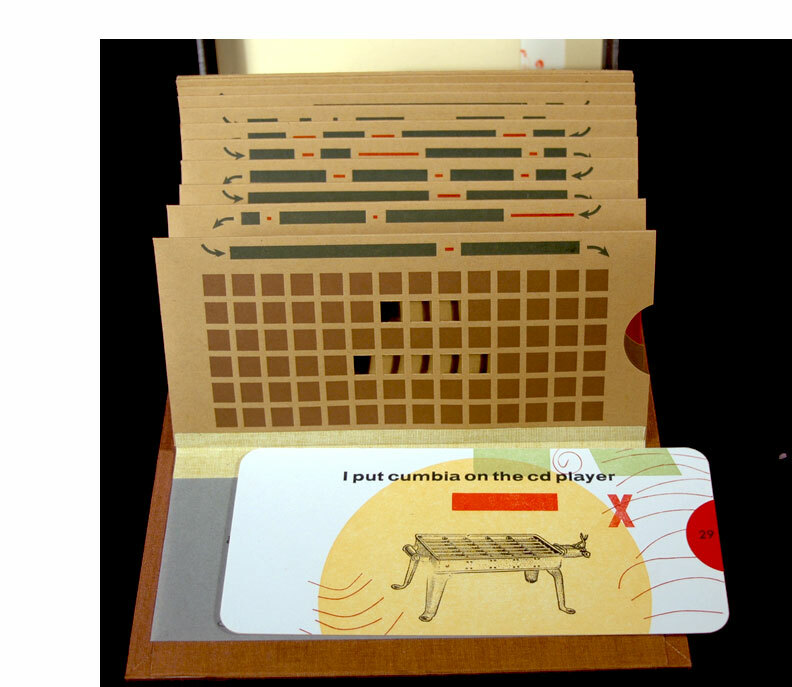 Container blurb: "This letterpress-printed animation short was printed entirely from antique news cuts, printer's ornaments, hand-set type and bell wire on a Vandercook SP-15 at Triangular Press. The pages were scanned, arranged and synced to the music at Zornado Productions." www.marilynz.com: "Hand-set type, printer's ornaments, and antique engravings come to life in this animated short created entirely through letterpress printing. 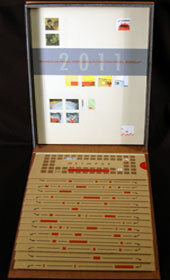 Includes behind-the-scenes showing letterpress animation techniques on the Vandercook. 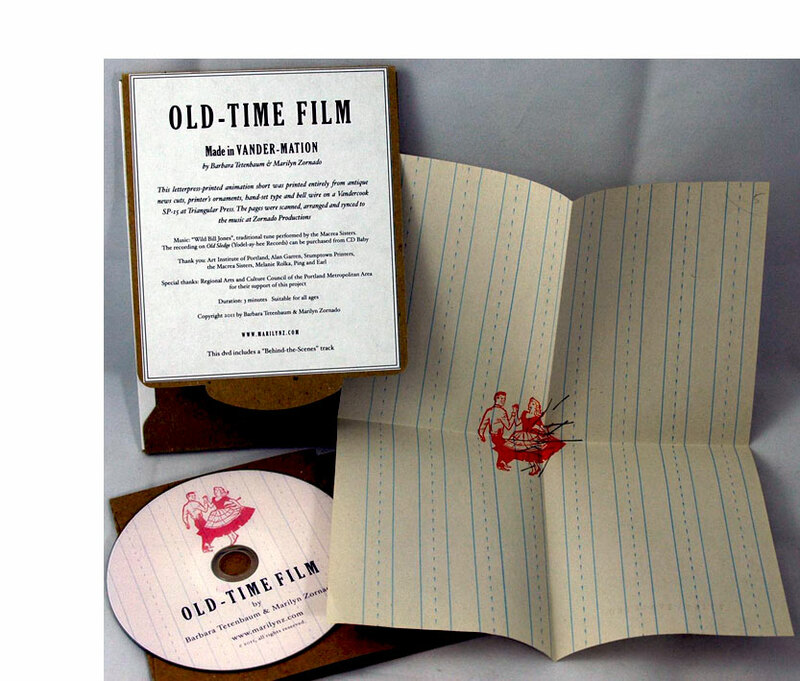 Handsomely packaged, the first 300 DVDs come with an actual handprinted image used in the film. A three-minute film suitable for all ages." The soundtrack for the animation is the tune "Wild Bill Jones" sung by the Macrae Sisters, an old-time stringband based in Portland, Oregon. Behind-the-Scenes shows the making of Old-Time Film. Tetenbaum and Zornado have dubbed their process of combining letterpress techniques and animation "Vander-Mation." In this production using Vander-Mation shoes tap, sheep jump an ornamental enclosure, and words expand and contract in time with the music. Portland, Oregon: Triangular Press, 2011. Edition of 150. 4 x 6.25"; 42 pages. Laid out on the computer and laser-printed. Hand bound in mid-century fake marbled boards. Title label tipped on front board. Signed and numbered by Tetenbaum. Barbara Tetenbaum: "Every typeface and style loaded onto my computer is cataloged in this small specimen book. The small piece of sample text offers a playful perspective on the voice of type design." Portland, Oregon: Triangular Press, 2008. Edition of 100. 3.75 x 6.5"; 38 pages. 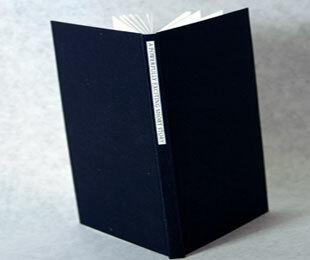 Bound in black cloth with paper title on spine. An artists' book for literary theorists, this postmodern metafiction harkens to the heady (and puzzling) days of conceptual art. 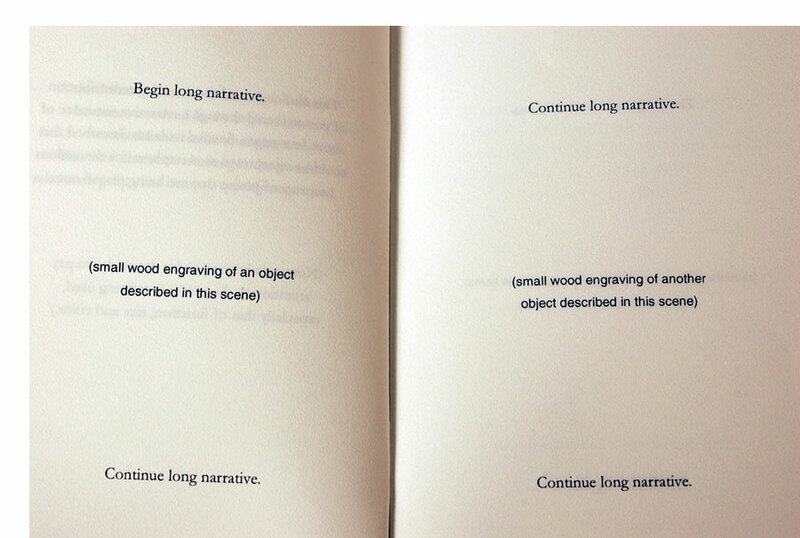 This is the reductio ad absurdum of conceptual art applied to literature. A Powerfully Exciting Short Story is the framework for "a powerfully exciting short story." The story begins: "Chapter One," "(a woodcut showing a scene of dramatic light and shadow)," and "Here is set a mood of calm-before-the-storm…." On the last page: "(this image makes perfect sense now)." The images are written about only: "(a small ornament)," "(a complicated image showing for modes of transportation)," or "(a small woodcut illustrating this clue)". This is the short story Sol LeWitt would have written had he been a writer: telling without showing, generality without specific, skeleton without meat (and certainly no heart). But it does have one other level, a level that perhaps justifies calling this an artists' book, and not just a postmodern mindgame. A Powerfully Exciting Short Story has form, form with all the expectations that form. It's elegant and neat, a small and austere book that fits comfortably into the hand; the printing is clear and crisp, promising weightiness, gravity, significance, and attendant honesty. Just a game? Or something powerfully exciting? Portland, Oregon: Triangular Press, 2005. Edition of 1000. 7.625 x 10.625"; 47 pages. This book was composed in types that come from John Downer's Paperback, a brand new revival/remix of the hardy Schotch Romans that shouldered the bulk of American commercial publishing before the advent of photosetting. This book was set range-right with four to the em wordspacing, using only type sizes from the typographer's traditional pallette. 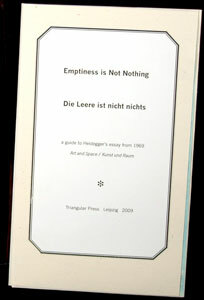 This book contains new pages from Gymnopoedia No. 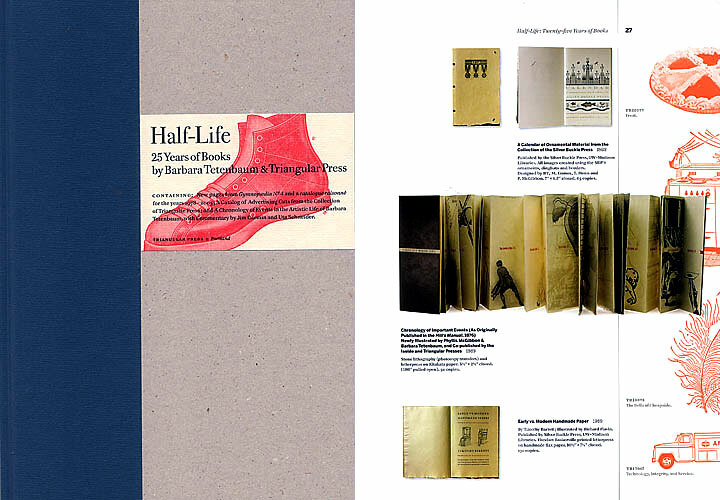 4 and a catalogue raisonne' for the years 1978-20005; A Catalog of Advertising Cuts from the Collection of Triangular Press; and A Chronology of Events in the artistic life of Barabara Tetenbaum, with commentary by Jim Carmin and Uta Schneider. Berkeley, California / Portland, Oregon: Triangular Press / Flying Fish Press, 2011. Edition of 100. 8.125 x 11.25 x 1.25"; 15 sleeves, 15 cards. Printed letterpress from handset type, wire, antique news cuts, dingbats, and photopolymer plates. Pages formed by envelope sleeves open ended on right. Each sleeve with miniature square window cutouts, and no sleeve with the same cutout pattern. In the form of a tablet with overlapping staggered 7.5 x 3.5" pages. 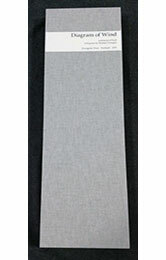 Sleeve enclosure is attached to box of cloth-covered boards with title tipped on front. Signed by both artists. Triangular Press / Flying Fish Press: "Working together again after almost a decade (Ode to a Grand Staircase, 2001), Glimpse is a new collaboration between Barb Tetenbaum and Julie Chen inspired by a conversation about how a person translates their life experience into a narrative form: prominent events may stand out as the nameable moments, yet it is the space between these events that life, in fact, is lived. "The mid-century photo album structure contains text written by Chen, examining this question. Her text is printed on both surfaces of each of the 15 hinged sleeves. Windows in the sleeves reveal small glimpses of the pull-out cards, each written and printed by Tetenbaum and containing dates and events of the non-important moments of her life. These texts are supported by diagrams, grids, and mundane imagery." Working together again after almost a decade (Ode to a Grand Staircase, 2001), two divas of the book arts world present a life lesson elegantly – as expected – and precisely – which is not quite a red herring, but at least pinkish. Glimpse contrasts the series of discrete events we use to define ourselves and the unexamined "spaces between events … when much of life is actually lived." The suggestion is that we should pay more attention to those in between times ("waiting for something else" times, perhaps, in John Lennon's terms). If we want certainty, as the precision of the books surface design seems to suggest is possible, we'll be disappointed, as the subtext – both in design and text – suggests. The glimpses provided by the book – through the windows in each sleeve – don't offer much with which to construct a human being, or even suggest at the woman/women behind them. If you pull out the cards, note the precise date and time, take in the fragmentary description of an event, make yourself aware of the stylized antique news cuts laden with stereotypes and implied significance – what do you have? What remains is the sense of something significant in the artifact and its implied significance. Perhaps the lesson is that we shouldn't be suborned by the obvious; it's always too scant, too easily misconstrued by our own desire for self-myth. It's part and parcel of Yeats' observation: We still can't tell the dancer from the dance, the water from the wave. We are. And some can make art. It's a glimpse of what we should cherish. 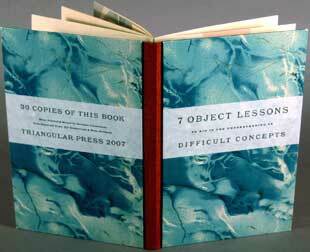 Portland, Oregon: Triangular Press, 2007. Edition of 30. 8.5 x 5.1". Bound-in accordion fold with 14 panels. Hand-set type, old engravings, and miscellaneous surfaces. 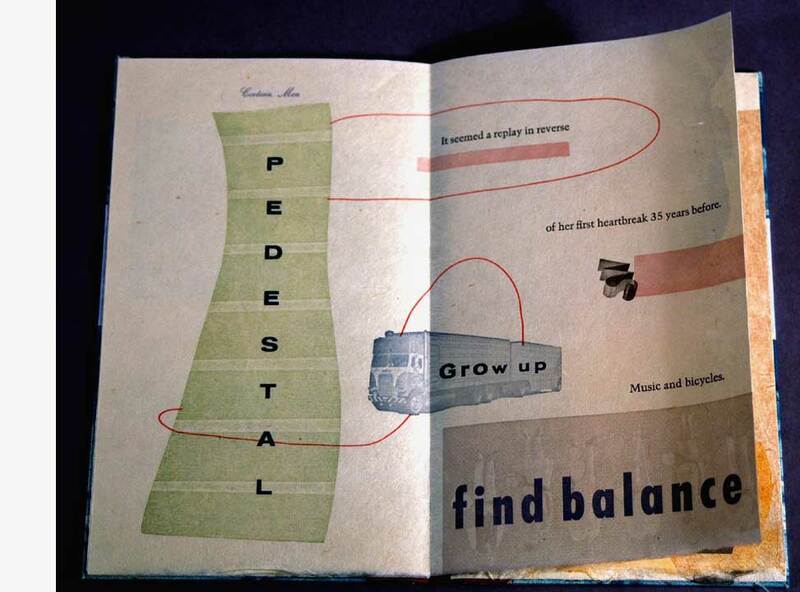 One object lesson rendered visually and typographically, or how one person found balance and a chance to move forward? Berkeley, California: Flying Fish Press, 2013. 3.75 x 5.5 x 1"; 108 cards. Two decks of cards in lidded acrylic box. 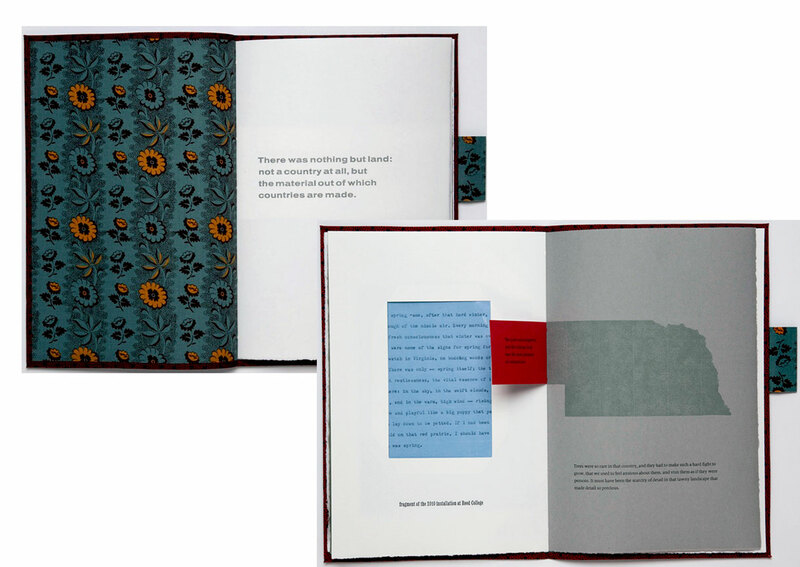 Barbara Tetenbaum: "The Artist's Book Ideation Cards was designed as an aid to the book artist, to jump start a new project or inform one in progress. 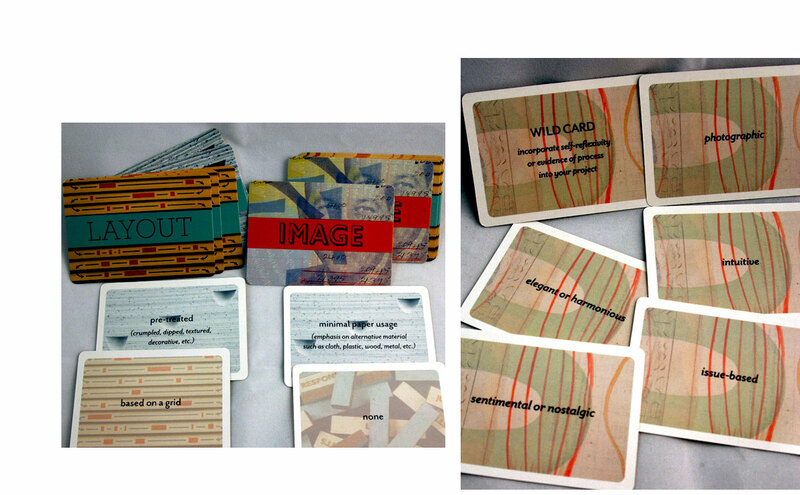 There are two decks in the set: Category Cards containing approximately 8 cards in each of the 7 categories (text - image - structure - paper - layout - technique - color) and 54 Adjective Cards of which 3 are wild cards. Choosing a card randomly from each of the seven categories and five cards from the adjectives offers an unexpected recipe for a project." Julie Chen: "The first deck of cards has different categories related to the basic parts of a book: text, image, structure, color, and layout. A second deck contains adjectives to be used for added influence." Leipzig: Triangular Press, 2009. Edition of 20. 5.75 x 8.875" closed, extends to 19 x 23.5", single sheet book. Silk-screen printed onto paper. Hand-applied watercolor. Map backed with linen. Contained in a mylar map slipcase. 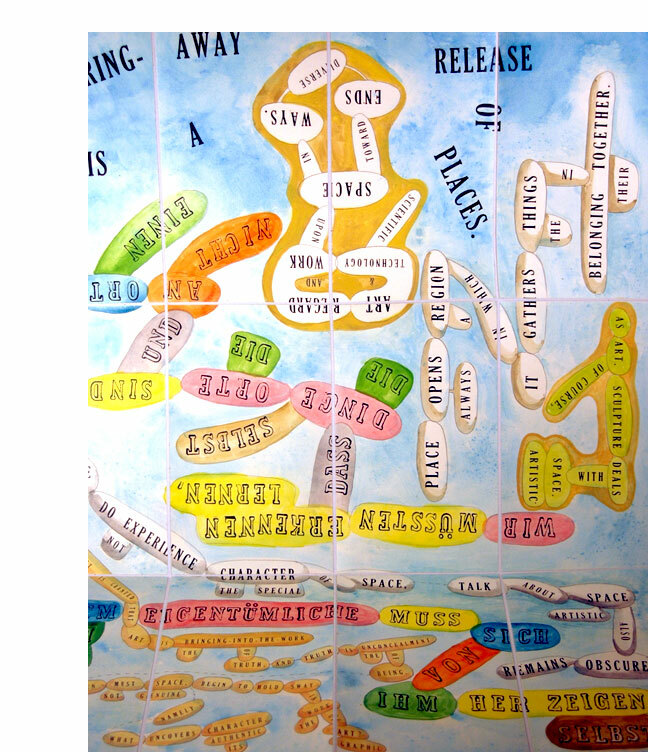 Barbara Tetenbaum: "This artist map is a response to Martin Heidegger's essay "Art and Space" (Die Kunst und der Raum) originally published in 1969. In the essay, Heidegger explains his new understanding of space after viewing the sculpture of Eduardo Chillida which led him to the realization that space is something unto itself and is given its special character in the presence of art. Offering a mode of way-finding through Heidegger's obtuse language, I turned Heidegger's words back into a visual form using my own method of sentence-diagramming. "The project was created during a year-long sabbatical in Leipzig, Germany. " Portland, Oregon: Triangular Press, 2005. Edition of 30. 7 x 11"; 24 pages. Printed letterpress from bell wire, sheet magnet, advertising cuts, and decorative rule. Text hand-set in foundry Trump Mediaeval. Bound in blue book cloth with paper title label on front board. This is the fourth in Tetenbaum's Gymnopaedia series, all somehow connected to musical scores. Gymnopaedia no. 4 is a score that is primarily visual, although it does have minimal text. The four parts run in columns from top to bottom of the page, all four fitting across one two-page spread. If you number the voices from left to right, voice one is almost purely abstract and resembles voice prints. Voices two, three, and four decrease in abstraction – at least the images do. There are seemingly unrelated meta-directions ("sustain the moment," "stubborn and childlike"). And voices three and four seem to be having a Beckett-like conversation. If it's music, it's silent, imaginary, and beautifully printed – like a four-leaf clover imagined by a blind woman. Portland, Oregon: Triangular Press, 2016. Edition of 33. 4.75 x 6.25"; 20 pages including pastedowns. Hybrid codex/accordion structure. Handset Meridien type and printer's ornaments, pressure printing into shaped vinyl relief plates were printed letterpress onto various Zerkall papers. Bound in cloth-covered boards with paper title label on front board. Signed and numbered by the artist. Barbara Tetenbaum: "The text came from a piece of writing made while on sabbatical in Leipzig, Germany in 2009, pondering the inability to silence painful thoughts connected to my life in Portland, 5235 miles away. The images came out of a different motivation: a desire to create a private visual space to calm my nerves during the stressful political campaigns. These two seemingly separate emotional investigations decided to come together in this book." Portland, Oregon / West Hartford, Connecticut: Triangular Press / The Harford Art School Print Workshop, 2012. Edition of 30. 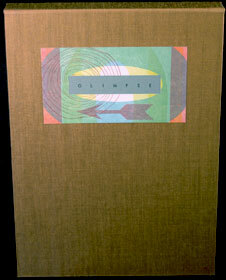 17 x 10" portfolio bound in cloth-covered binder's board. On the base of the portfolio is a hinged wooden frame opening left to right. The window of the frame has treated glassine with printed titles. Behind the frame is a suite of five copperplate etchings. Nestled within the window of the frame is a cloth-covered pamphlet stitched book (10.25 x 7"). Within the book is a foldout map and a fragment from the 2010 installation of "My Antonia" at Reed College as well as excerpts from the Cather novel. 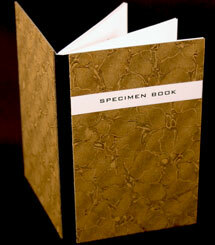 The excerpts were handset in foundry type and printed letterpress on Zerkall papers. Signed and numbered by the artist on the colophon. Barbara Tetenbaum: "This project is the second in a series of artworks stemming from the experience of reading Willa Cather’s novel My Ántonia. "In the summer of 2010 I spent a month in the gallery at Reed College listening to a recording of Willa Cather’s 1918 novel, My Ántonia. I had wanted to put myself in the position of a first-time reader and respond to the story however it moved me. I assumed I would draw directly on the walls as I listened and that this would be the basis for the exhibition. Instead I was amazed and captivated by the pure gorgeousness of Cather’s writing. What took me by surprise was how emotional this experience became. Listening each day to her descriptions of the landscape and the sky brought me to tears, the kind that have no root in sadness or nostalgia but came from a place deep in my being. I surrendered myself to her words, retyping excerpts onto many scraps of paper and pinning them to the walls of the gallery or suspending them from fishing line for viewers to bump into. "Using the entire floor of the gallery, I mapped out the novel with colored drafting and electrical tapes, assigning a color and size to each character. The end result resembled a map of the London Underground and the room was a kind of exploded view of the novel. Visitors navigated the story as they roamed around the gallery. "This project represents a desire to put this experience back into book form. 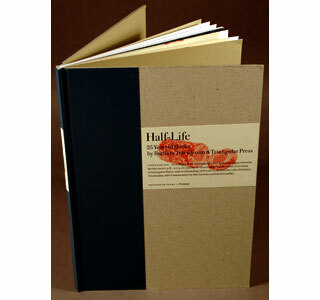 It features five automatic drawings made while listening to the novel, printed as etchings. 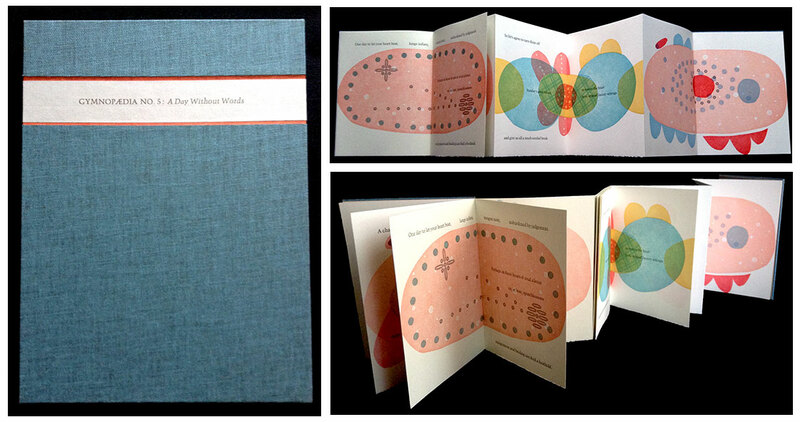 A cloth-bound book of handset letterpress-printed excerpts accompanies this. 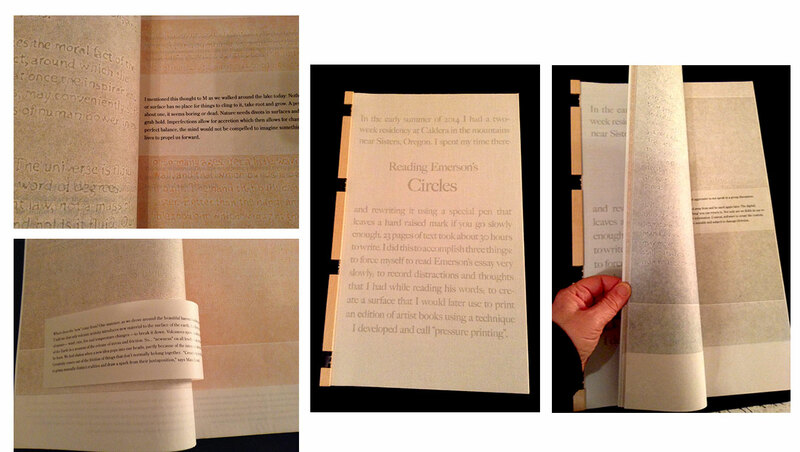 A large fold-out map of how I see the novel, printed as a large etching with letterpress text, is housed inside the book along with one piece of text from the original Reed College installation. 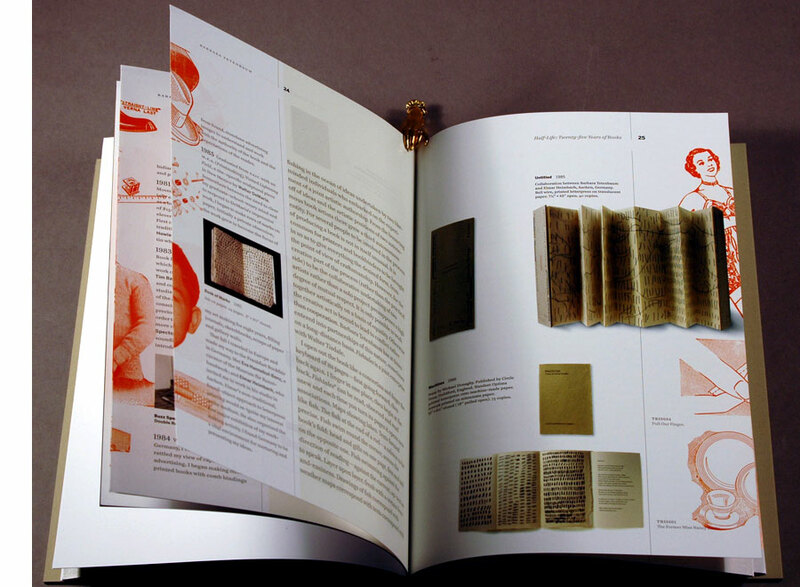 Nathalia King, Professor English and Humanities at Reed College, Reading the Literary Text as 'Art in Space': "To my mind, Tetenbaum's artist book, Mining My Antonia (2012) occupies the mid-point on the spectrum of this process. Its centerpiece is a series of prints (one for each of the five chapters in My Antonia) that are the product of automatic drawing - a process which explores the relation between the moving hand and the processes of thought and emotion, especially as informed by the unconscious mind. Embraced by the Surrealists (Masson, Miro, Dali, Arp, and Breton), automatic drawing can be defined as a dialogue between unconscious and conscious mental activity, between a deeply experienced drafting hand and a willfully empty mind. The hand must work freely and without deliberation, using the simple forms of a continuous and involved line, so that the artist's characteristic expression or motor memory can slide past consciousness - especially as the latter depends on the codes and conventions of illustration ... The psychic mechanisms activated here are those that Freud identified with the dream, the joke, and the symbol: the mental condensation and displacement that allow for the unexpected release of perception, the discovery of relations in randomness, visualization of pure intuition. Listening again to Cather's book on tape, and using copper etching plates prepared by master printer, Kathy Kuehn, Tetenbaum drew with an etching needle, pencil, and paint brush on hard, soft, and spit bite grounds respectively. From these different combinations of tool and surface different graphic textures emerged, varying from sharp and incisive to soft and hazy. Concomitantly, each plate became a sort of visual transparency of Tetenbaum's aural experience of a section of Cather's text: her graphic textures invoke elements of sky and water, or aspects of womanhood and boyhood. 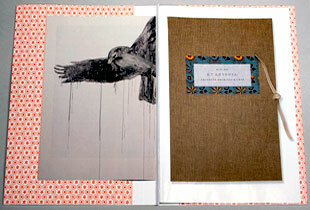 The other components of this artist book also each serve to translate the written text into images of various media. A large map reinterprets the movement of characters in space, just as smaller maps stand in for their voyage from Bohemia to Nebraska. 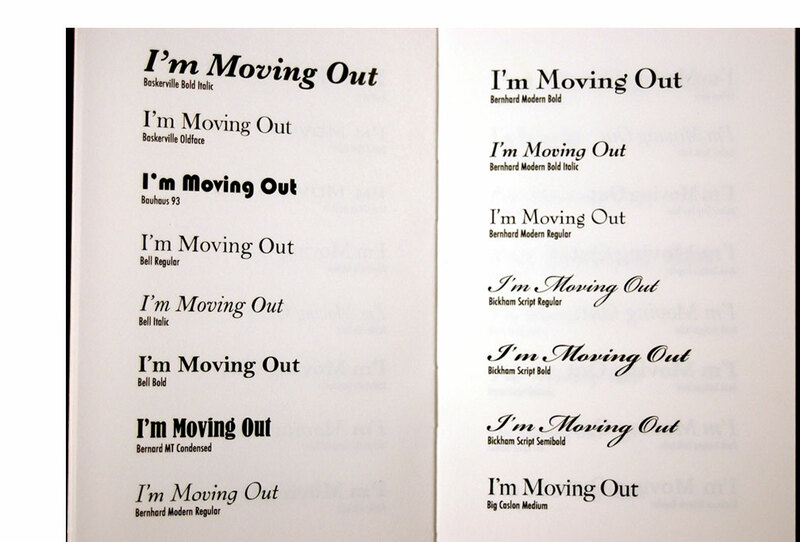 For Tetenbaum, even the different typefaces she used and the different orientations each medium had to the original text reflected some aspect of a process of reading and interpretation in which one book becomes another book." The pamphlet A Close Read: The Cather Projects is included.